St Myllins Church ChurchSt Myllin's Parish Church is in the centre of Llanfyllin, a small market town nestled in the round, green, sheep-dotted hills of northern Mid-Wales, close to the English border, but still distinctly Welsh in character. The Church, built of soft red brick, dates from about 1706. The present building is built in local brick in a simple preaching house style. In 1826 a schoolroom was added which now serves a vestry and meeting room. 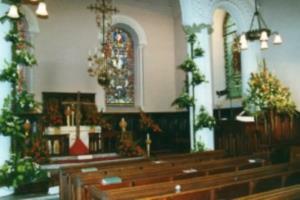 A major re-planning of the church interior took place in the 1850s. The church seats approximately 300 people, and is unusual in having no central aisle. Its' light interior and delightful stained glass remind one more of Bavarian rococco style than of most English churches. The outstanding acoustic qualities of the church make it a near perfect venue for world class chamber music. The Church is inextricably linked to the history of Llanfyllin. It was built at a time when the town was growing in wealth and population, but when tensions between political and religious factions were still unresolved after the civil war. Its solid presence on high ground in the town, with battlements around the parapet and tower, symbolised the power and authority of many gentry families of Llanfyllin, in the face of growing allegiance to alternative ways of worshipping. The church was founded in the 7th Century by the Irish Bishop Molling (Myllin) and the earliest references to a church in Llanfyllin appear in the Norwich Taxation of 1254. Llansantffraid-ym-Mechain: turn left just beyond the bridge and right at the far end of Llansantffraid, following signposts for Llanfyllin. After about four miles turn right onto the A490 at the T-junction. The A490 ends in Llanfyllin. Visitors travelling south from Oswestry on the A483 towards Welshpool should turn right for Llansantffraid at the Llynclys cross-roads.